purple cow | If you want life to change, YOU have to change! One of my goals is to read at least one book a month. Over the past few years, I’ve become a big Seth Godin fan. It all started with “Purple Cow” a call for the need to be remarkable. Last year I read “Tribes” and was wowed by his insight into the need of the masses to be led. 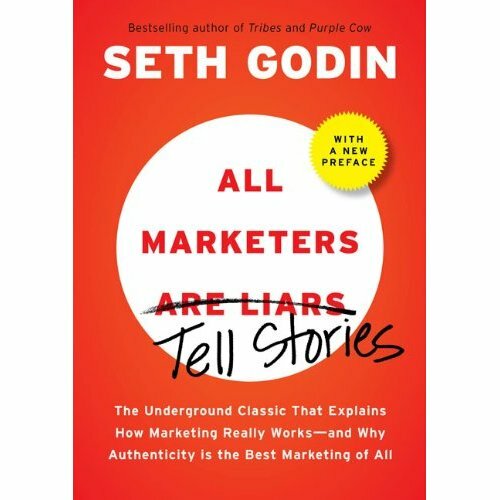 The first book that I read this year was “All Marketers Tell Stories.” As you can see from the cover to the left, the book was originally titled “All Marketers Are Liars.” Proof that even marketing gurus like Godin can make missteps. I hate to admit it but…the misstep extended beyond just the original title of this book. I usually mark up Godin’s books with yellow highlighter and notes in the margins. Not so with this one. Maybe it’s the fact that I’ve known for years that “facts tell and stories sell.” I’ve known the power of storytelling. It’s what’s transformed Shawn Corey Carter and Sean John Combs into Jay-Z and Diddy. It’s what calms the savage beast (also known as pre-school aged children). Steve Jobs of Apple is masterful at this. I was reminded of this last week when he unveiled the iPad. Every phone that has come out since the iPhone has been trumpeted as the “iPhone killer.” While the iPad has no doubt rendered the Kindle obsolete, Jobs never spoke poorly about the Kindle. Instead he made a comment to the effect of the iPad “standing on the shoulders” of the work that the Kindle has done thus far. He never had to say that the iPad was the “Kindle killer.” He just unveiled a remarkable product and allowed us to connect the dots. Perhaps this is the lesson to learn in presenting the ACN opportunity. Nathan Goldberg is (in my humble opinion) the BEST presenter of the ACN story that I have ever seen. If you’ve never seen him in action, you can do so here. Nathan is the king of subtlety. He asks tons of rhetorical questions that we all answer “in our head.” In so doing, he allows us to connect the dots. I guess that’s the lesson that I’ve learned is that I need to be more cognitive of the worldview of the people that I present the ACN opportunity to. I need to be a little more subtle in my message and leave room for people to connect the dots for themselves. Without even realizing it, I’ve been tooting my own horn a little bit too much. I’ve made a few changes and in just a few days, I can honestly say that I can see changes in the way that people are responding. So tell your story. Make sure it’s authentic. Make sure it’s real. Make sure it’s you. Facts tell and stories sell.